COLD SPRING, NY--(Marketwired - Apr 10, 2014) - The telemedicine landscape is rich with online provider networks and one-off physician-patient encounters. Filling the demand for instant healthcare, medical professionals effectively and efficiently treat patients through video appointments. Now, with the help of CloudVisit Telemedicine, a growing number of healthcare businesses are expanding on the power of telemedicine to engage with patients online. Merging patient care and business development, industry leaders are creating innovative, custom-branded telemedicine and telepsychiatry programs designed to empower patients in healthcare decision-making and long-term wellness. Many are partnering with CloudVisit Telemedicine for their unique software as a service (SaaS) telemedicine platform. Available as a private-label platform, CloudVisit delivers robust out-of-the-box features that can be expanded with custom functionality. According to CloudVisit president and CEO, Daniel Gilbert, custom-branded telemedicine initiatives hold tremendous opportunity for pharmaceutical companies and medical device manufacturers. "Patient relationships and a relatable brand are the mainstays of healthcare business success. Our technology provides a strong foundation for health-centric companies to implement patient programs centered on video connectivity." Telemedicine is destined for far more than remote healthcare. A comprehensive wellness plan, centered on video appointments, becomes the thread of success to keep patients engaged and compliant. These custom-branded, physician-guided programs allow patients to participate from home for everything from weight loss and management to chronic disease and mental health support. Through ease-of-use and tangible results, patients remain committed to the healthcare professional, the method of care, and the entire branded program -- all made possible by CloudVisit functionality. Patient advocate programs put peer-to-peer healthcare to work for surgeons, hospitals, and the healthcare industry. 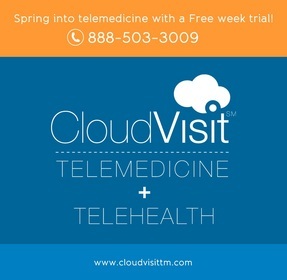 CloudVisit Telemedicine connects patient success stories with patients in need for real-time, candid video chat. Privately, patients get the valuable insight they need from like-minded individuals before selecting a treatment protocol or surgery. The entire custom solution establishes patient trust in the parent brand, service, and care. "The overall business model is patient relationships," said Gilbert. "That's what our telemedicine and telepsychiatry platforms help cement. We're blending our innovative technology with clients' medical expertise to fortify the patient relationship." Built on ten years of medical programming and development expertise, CloudVisit's telemedicine platform helps businesses launch custom programs with everything from private medical consultations and peer video session to medically directed, patient-guided wellness programs.